The Fass Fuel System provides exceptional performance for the car that has a diesel engine. The fuel air separation systems come in three different types: the HD series, which is the most comprehensive line in the Fass Fuel System; the platinum series, which is for the heavy duty diesel vehicles and the titanium series, which is cost efficient. The HD series is one of the largest Fass fuel system pumps created, and provides sturdy reliability for long usage on highways and roads as well as tremendous road conditions. The titanium series was created using the same type of versatility and durability as the HD series, just is a smaller version of the two. The platinum series meets and exceeds your Fass Fuel System expectations with its inexpensive cost and high quality performance. For the Fass fuel pumps, look no further than the standard, the adjustable and the Dodge Direct replacement. Each is specifically designed to meet your diesel engine needs. The standard fuel pumps produce flow rates of 90 to 260 gph and fuel pressure up to 160psi. 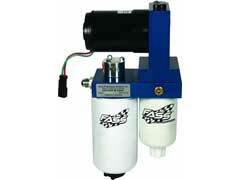 They are similar to the Walbro fuel pump and Carter fuel pump in performance. The adjustable fuel pump is known as one of the most well-versed fuel pumps in the Fass Fuel System. Like the carter fuel pumps, these particular pumps give dependable fuel pressure keeping the needs of your diesel vehicle first. The Dodge Direct replacement is for those engines that can handle the harsh, chilly winters and terrain. Other accessories that can be purchased for use with the Fass fuel system are the fuel transfer pump, which range in price from $149 to 1,299. It is fairly easy to install the Fass fuel system, as it also is to install the Airdog fuel system. Both are user friendly and offer a wide range of fuel pumps and air separation systems that make for a pleasant experience.